Hi, I am interested in your 1970 Chevrolet Chevelle (stock #1215-NSH) listed on Autotrader for $44,995. I'd like to get more information about this vehicle and confirm its availability. One of the nice things about building a tribute car is that you can have the appearance of the real deal for a fraction of the price. Tribute cars have been gaining popularity for years and this car is exactly the reason why. Check it out. Starting with a car that many consider to be the best-looking muscle car of all time is almost like getting an unfair head start. But this race was run clean and won through the hard work of dedicated craftsman and the commitment of the owner to build this beautiful car. It is presented in Desert Sand and you would be hard pressed to find any flaws in the paint. Its gorgeous! Bold black stripes run up the cowl induction hood held down by pins up front. The grill leads with an SS emblem and is surrounded by fresh chrome trim as well as underlined by a shiny new bumper. More chrome outlines the wheel wells and SS 396 badges appear on the front fenders. The back of the car is finished out nicely with the proper blacked out panel in the bumper sporting another SS badge along with Chevelle in script on the trunk lid and a couple chrome exhaust tips peeking out from under the bumper. The same high quality of work, fit and finish continues on Black interior of this car. The door panel is spotless with a pleated center section trimmed out in chrome piping and an SS badge at the front. The bucket seats have been freshly recovered with textured vinyl centers with smooth side bolsters. A black steering wheel with a polished three spoke hub and bowtie horn button on a tilt column with a Sun Super Tach II mounted to it. Just a flick of the wrist to the right is the Hurst shifter for the 4-speed manual transmission rising from the center console. The dash board is so neat and clean that it looks factory new. A few nice upgrades include Autometer gauges to keep accurate track of oil pressure and water temp mounted to the A-pillar and a stereo head unit that is an FM/Cassette player as well as iPod compatible with a CD changer in the trunk. Pull the pins and pop the hood and you will find a freshly rebuilt 396 nestled down in a well detailed out engine bay. There is a black air filter housing with a Turbo-Jet 396 decal sitting on top of a Weber 4-barrel carburetor that feeds an Edelbrock Performer 2.0 intake manifold. Chrome valve covers add a splash of flash to the engine bay with the rest of the engine iron painted in the correct Chevrolet Orange. Fresh components throughout include new plugs, cap, and wires as well as and new alternator and all the belts and hoses. The air conditioning compressor as well as the lines have also been replaced to keep you cool on those hot summer days. The chassis received its share of love too with fresh components and bushings that help this car handle very well. Power front disc brakes insure that you can haul this car back down from speed if you decide to let the horses run and the rubber meets the road through 225/70R14 tires on black and polished rally wheels. 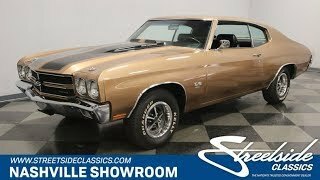 A better than new tribute to the awesome SS 396 Chevelle. Come on down, check it out, and you are likely to decide that you just have to take this one home with you.